I want to thank the person, or persons who took the time to put the high road training course together. 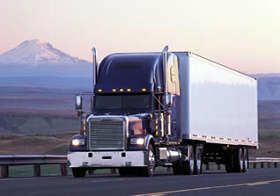 It was very useful and helped me pass my CDL permit test here in South Carolina. I never cracked a book! All I did was follow the program. Im not a good test taker, and I only missed 7 questions out of 95. Thanks for helping me in my quest to get out there on the open road! Thanks again! Thanks to all that have replyed back! I will be looking at all of the info on this web site, and more before I make the dig jump. Oh TMC's terminal in Columbia S.C. is about 10 miles from my house. Thanks again for all yall do to help others that are in need of answers, and encouragement. Old school, thanks for the info! Just to give a little info/ background on myself, I'm 43 years old and am a captain in the fire service in South Carolina and have 13 years of experience. I have always wanted to drive big truck OTR, but I've stayed home to help raise my son. Know that he is out of school, and working I'm thinking of leaving the fire service to hit the road. I'm doing a lot of research on companies, schools,etc. my wife is very supportive, but I am getting grief from friends and family about leaving to drive truck. I'm just not sure if I should dive in head first? Thanks again, and I would appreciate any input. Hey all, Im new to the site, and have found it to be very helpful. Im thinking of applying with TMC Transportation. Does anyone have any info on this company? I've heard that they are a good company to work for. Thanks for any comments.